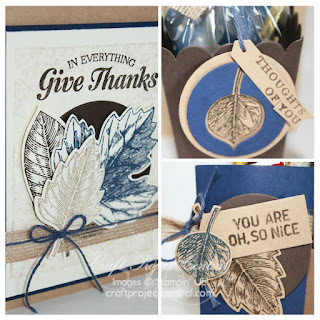 Just Julie B's Stampin' Space: Fall Leaf Treat Box Trio! Get ready for Fall with this set of tempting treat holders! Each treat holder is made using the fabulous new Popcorn Box Thinlits. You’ll see how versatile these thinlits are when you learn how to make a Treat-Filled Popcorn Box, a Pocket Treat Holder and a Basket. Just a few quick and easy adjustments make these simple, but oh, so cute little gifties! Plus you’ll see how to adapt the new Suite Seasons Stamp Set into more general sayings for anytime use! And the coordinating card can be used with any one of the treats for gift giving! This Fall project was made by ME!! And you can get the tutorial for my project when you subscribe to the month of September over at Craft Project Central.